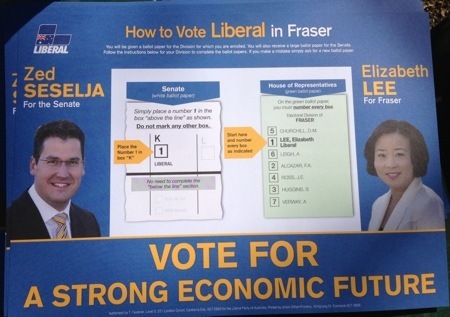 In order to vote for a sensible and stable conservative government, I quite happily followed the Liberal Party’s “how to vote” card for the House Of Representatives, and would thoroughly recommend that people do the same for their local Liberal or National candidate. I did, however, have to vote below the line for the Senate as I was not comfortable with the full set of preferences. I’m not keen on the Bullet Train Party getting the second set of preferences, so I replaced them with Bob Katter’s party which would be a much more sensible bunch, and I had to push the Voluntary Euthanasia Party as far down the list as possible while keeping Labor and The Greens last. 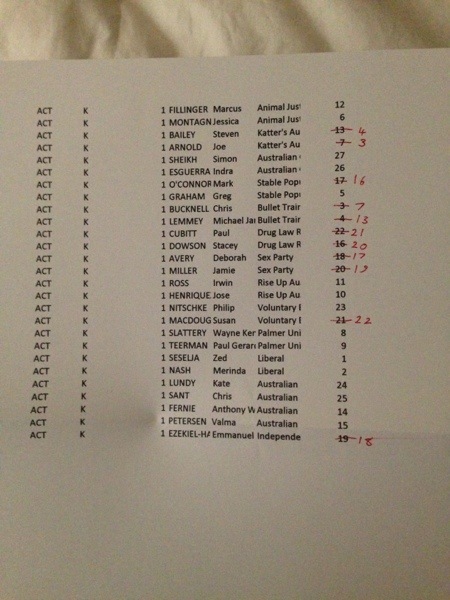 As such, this is how I adjusted the Liberal Party’s senate preferences for my below-the-line vote. The other benefit to voting below the line is that, due to the complexity of it, the counting is done by computer, not a human, which has some benefits when you consider how convoluted the Senate preferential voting system is.